We are pleased to announce a new dentist joining our practice here at Aesthetic & Implant Dentistry of Atlanta. Please welcome prosthodontist, Dr. Aundrea Eady, DMD. Dr. Eady hails from sunny, West Palm Beach, Florida. Her aspirations as a child leaned towards mechanical engineering. She did her undergraduate work at Spelman College in Atlanta, GA, earning a B.S. in Biology in 2007. While studying at Spelman College she discovered her passion for dental medicine during a summer internship program at Case Western Reserve University in Cleveland, Ohio. At the recommendation of her mentor, Dr. Cynthia Hodge, Dr. Eady attended Tufts University School of Dental Medicine in Boston, MA, earning her Doctor of Dental Medicine in 20ll. Inspired by her professors, Dr. Eady decided to extend her time at Tufts for another 3 years and specialize in prosthodontics. In May of 2014, Dr. Eady was awarded a Certificate in Prosthodontics, again from Tufts University School of Dental Medicine. She continues to serve on the faculty at Tufts as a Clinical Instructor. 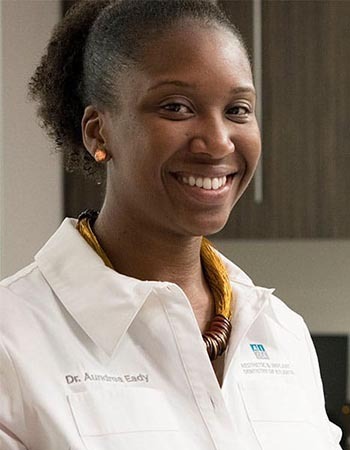 Her professors at Tufts remarked how Dr. Eady was the top in her field of prosthodontics in her classes and highly recommended that Dr. Eady would be an asset to the patients of Aesthetic & Implant Dentistry of Atlanta. From her eight years of training at Tufts, Dr. Eady became highly skilled in her field of prosthodontics which includes, crown and bridge, dental veneers, dental implants, implant supported dentures and all phases of cosmetic restorations. “Dr. 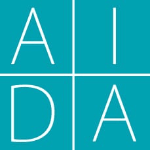 Eady’s training will enable the team at Aesthetic & Implant Dentistry of Atlanta to provide excellent quality of dental services to the patients we are privileged to serve,” says Dr. David Zelby founder of AIDA. Dr. Eady enjoys utilizing her skills learned at Tufts University School of Dental Medicine. She remarked on a recent case in which a middle aged woman’s smile was completely rejuvenated by using carefully crafted porcelain crowns. At Aesthetic & Implant Dentistry we work in conjunction with one of the finest dental laboratories in the country. Our crowns are very natural appearing, with shade gradiation allowing the ends to be slightly translucent, just like your natural teeth. We refrain from using chunky dental crowns that are totally opaque from top to bottom. 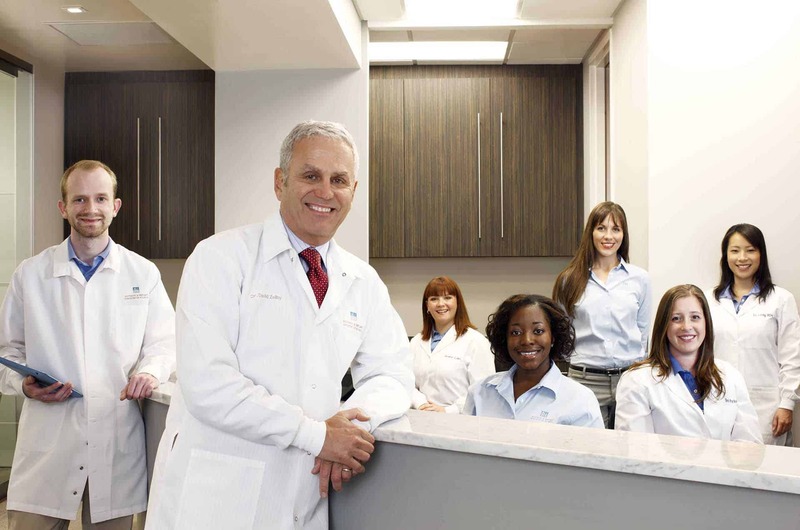 While your treatment may involve other dental procedures or a combination of dental procedures, Dr. Eady stands out in the field of prosthodontics. Acquiring a certificate in prosthodontics involves three to four years of additional training after completing dental school. Prosthdontist, Dr. Aundrea Eady specializes in highly complex restorative dental procedure such as dental crowns and bridges in Atlanta, GA. Carefully crafted by a specialist, crowns and bridges can give you the smile of your dreams. Dental crowns can correct stained or worn-down natural teeth adding years to your appearance, correct teeth that are tilting and shifting because of a gap, or repair teeth that have been severely damaged through decay, grinding, malocclusion, injury or medications. She also uses dental veneers or inlays and onlays, more conservative methods of teeth restorations, if the tooth structure and gum health of the patient allows for those procedures. “The patient must be careful examined, I explain all of the options available and then we develop a treatment plan for them that is both cost effective to achieve their goals and long lasting,” remarks Dr. Eady. “I’ve had patients coming in wanting dental veneers when all they really need is a simple composite bonding. I take a conservative approach and build long lasting relationships with my patients”. Dr. Eady lives in Smyrna, Georgia with her husband who is employed at Emory University. In her free time she enjoys traveling, jogging and becoming reacquainted with Atlanta. She loved Atlanta as a student while attending Spelman College and is glad to return after eight years in Boston, MA completing her dental education. Are you missing teeth causing you to be self conscious? Do you find yourself covering your smile? Don’t be embarrassed any longer— we can help. Whether you are looking for a mild cosmetic dental enhancement such as composite bonding, or a complicated procedure involving dental crowns, dental partials and dental implants we invite you to call Aesthetic & Implant Dentistry of Atlanta to schedule an appointment with Dr. Aundrea Eady, DMD. Serving patients in Metro Atlanta, Smyrna, Vinings, Buckhead, East Cobb, and Roswell, GA.